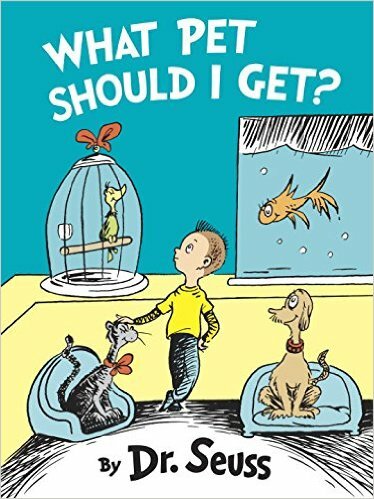 “I want a pet, I want a pet, what pet should we get?” is the mantra of the latest Dr Seuss children’s book, published for the first time in July 2015. The manuscript for this book was found amongst the papers of Theodor Seuss Geisel (Dr Seuss) almost 25 years after his death. From what I can see, the illustrations are classic Dr Seuss, as is the rhyming language he liked to use for his young audiences. I grew up with Dr Seuss – Horton Hears a Who was a favorite. And so it is rather nice to think that a whole younger generation of kids can talk about the newest Seuss book. Tagged Dr Seuss, pet store, Theodor Seuss Geisel, What Pet Should I Get? Dogs purchased from pet stores are more likely to have a range of behavior problems than those purchased from small, non-commercial breeders, says a study by researchers at the Best Friends Animal Society and the University of Pennsylvania School of Veterinary Medicine. The study was published in the Journal of the American Veterinary Medical Association. The study involved 413 dogs purchased from pet stores. Psychological and behavioral characteristics of these dogs were compared to the same characteristics in 5,657 dogs obtained from small-scale, private breeders. (Most puppies sold in pet stores in the USA are sourced from large-scale, puppy mill type commercial breeders). Results show that dogs obtained as puppies from pet stores showed significantly more aggression toward human family members, unfamiliar people and other dogs. Dogs purchased from pet stores were almost twice as likely to exhibit aggression directed toward unfamiliar dogs than dogs purchased from small non-commercial breeders. The pet store dogs also a displayed greater fear of other dogs and typical events in pet dogs’ lives, had more behavior problems when left alone at home, and experienced more problems with house-soiling. These behaviors in young adult dogs are reasons typically cited by people who surrender their pets to animal shelters. “The results were so one-sided that in the wide range of behavior problems we included in our analysis, pet store dogs failed in every single case to even obtain one more favorable score than the comparison group of dogs” says Dr Frank McMillan of Best Friends Animal Society. The research team acknowledges that the exact causes of the behavioral problems observed are not known; until these causes are understood, they recommend avoiding purchasing puppies from pet stores.